There are many species of ants that occur in lawns or along and under sidewalks. Most ants are beneficial and do not require control. However, ants may become a nuisance by constructing mounds or small hills in the lawn or on the sidewalk or patio, or by invading the home in search of food. There are no fire ants in Iowa; our ants are not biting or stinging pests. Soil-nesting ants construct mounds or small hills by bringing granulated soil to the surface from the nest below. These mounds may be unsightly, may cause lawn unevenness, and if large, may smoother out the surrounding grass. On the sidewalk or patio the deposited soil may be unsightly. To avoid some of the worst ant hill trouble rake or wash the anthills smooth on a regular and frequent basis as they appear. Use a rake or water stream from the garden hose to disperse the soil. The need for such maintenance will be greatest during periods of prolific ant nesting activity (such as during periods of wet spring weather). Only as a last resort should it be necessary to spot treat anthills with an insecticide such as permethrin, cyfluthrin or esfenvalerate. Rake the anthill flat and sprinkle granules onto the soil surface or drench the mound area with diluted solution. Read and carefully follow instructions on the insecticide label. 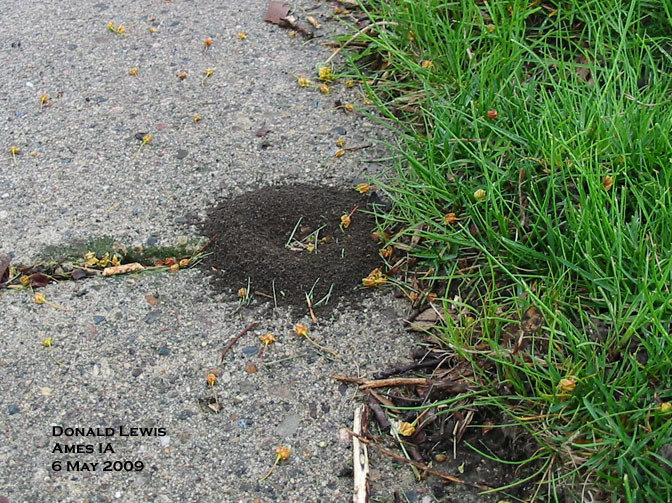 Ant mound along sidewalk. Photo by Donald Lewis.